"Life is a little bit like a ship and sometimes it feels like you're sailing solo, but you're not because I'm with you." How far would you go for the ones you love? Yasmin never thought she would voluntarily leave the comforts of her home in the UK to meet with her husband Matt in the desolate environment of Alaska. When Matt told her weeks before that he would embark on an expedition to the state to film wildlife, she assumed it was just another excuse to be away from home. Their relationship had not been the same since the revelation that Matt had kissed another woman. All of that seemed like a distant memory now. Matt and Yasmin have a ten-year-old daughter named Ruby. Ruby is deaf. Life has not been easy for the girl, but her parents have done their best to shield her from the realities of the world. Matt and Ruby share a special bond. That's why Yasmin is here in Alaska. When she received the news that the small village that Matt was staying in was engulfed in flames with no apparent survivors, she gathered her daughter and rushed to the US. There must be some mistake. With the authorities refusing to listen to her insistence that her husband is still alive, Yasmin takes it upon herself to travel through the treacherous landscapes of Alaska to find her husband and keep her family in tact. Rosamund Lupton, author of the bestselling Sister, returns with The Quality of Silence. The novel alternates perspectives between the unflinchingly determined mother and her innocently observant daughter. This contrast makes for strong character development and back story that elevates the otherwise straightforward plot. At the start, it is rather difficult to connect with Yasmin. All logic points to her husband being dead, but Yasmin recklessly defies this. In the process, she places herself and Ruby into an unnecessarily dangerous situation. Fortunately, the character becomes more well rounded through her daughter's recollections. It is in the parts about Ruby that Lupton's skill shines through. The young girl is extremely intelligent and her voice reads as that of a genuine child. Lupton captures the love, wonder and confusion of a child who is on a strange journey that she can't fully comprehend. The fact that she is deaf only adds to this brilliance. The Quality of Silence unfolds as a slow churning thriller that keeps the suspense tightly wound throughout. Still, the novel seems a bit uneven in its execution and the story ends without the ultimate payoff that the steady pace demands. The Quality of Silence is a unique story that adds to the promise of greater output from Lupton in the future. To enter for a chance to win an ARC of this novel, use the RaffleCopter widget below. Open to US residents. No PO boxes please. Ends 4/5. After being contacted, winner will have 48hrs to respond. For more information visit the author's website, Amazon, and GoodReads. 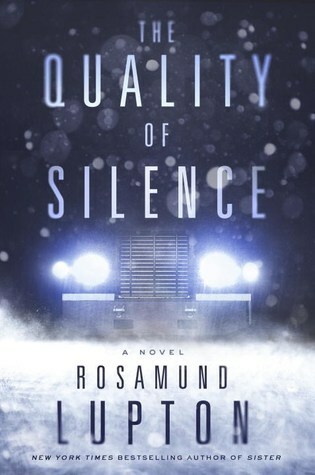 This entry was posted on Thursday, March 24, 2016 and is filed under Book Giveaway,Book Review,Crown Publisher,Giveaway,Rosamund Lupton,Sister,The Quality of Silence,Thriller. You can follow any responses to this entry through the RSS 2.0. You can leave a response. Thanks Ethan for the tip about this book! Appreciate it! Whoa! This books looks like it's going to be a good read!